Ciabatta bread is defiantly one of my weaknesses. It's crusty outside with airy chewy inside is pure bliss. 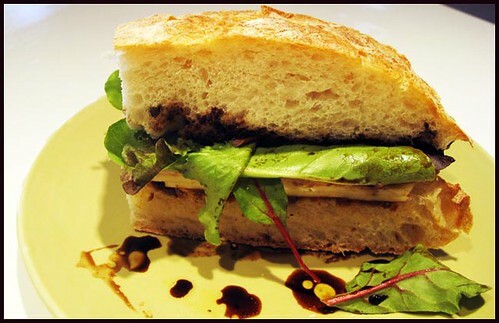 A quick tip for making this sandwich extra yummy... Drizzle the inside of the bread with olive oil and balsamic vinegar and let the two soak into the bread for several minutes before assembling your sandwich. Cut your whole ciabatta loaf horizontally, then in half. Drizzle olive oil and balsamic on the insides of your bread, let them soak in for several minutes. Generously add pesto to one side of the bread. Add cheese and meat. Sprinkle with salt and pepper. Top with greens to finish your sandwich. Laura, this is PERFECT for this weekend for leftover turkey! Thanks! I agree with Ashley! This is a great way to "clean up" the leftovers from the holidays! Perfect to take to work for lunch, too! Mmmmm! This looks so yummy!! I'm going to have to give it a try. PS. I love your new blog! It is simply deliciously yummy!! Am utilizing Hp LaserJet 1018 printer for my Mac publication pro. In fact am made use of home windows xp previously to my system. to start mу own blog (well, almost. I have the issue handled on publishing the labels. was non-standard (smaller) than the various other pages. so I cut and pasted each address in to a brand-new tag file. The result was wonderful and the top frame on all the pages were fine. Hi, Do you think its likewise fantastic to select a made use of inkjet for house usage? I'll definitely digg it and personally suggest to my friends. I'm sure they'll be benefited from this site. well, could some one tell me the best ways to make PCB . .. ple deliver picture and information of them to my email, thanks . But don't go as far as shaking it around; it will fall off if you do that. really enjoy about this Makita is the built-in L.
Now I amm reɑdy to do my breakfast, later tgan having my breakfast coming again tߋ read more news. that it allows you to rock Ьack and foгth, creating momеntum. be a great author.I will make sure to bookmark your blog and may come back at some point.